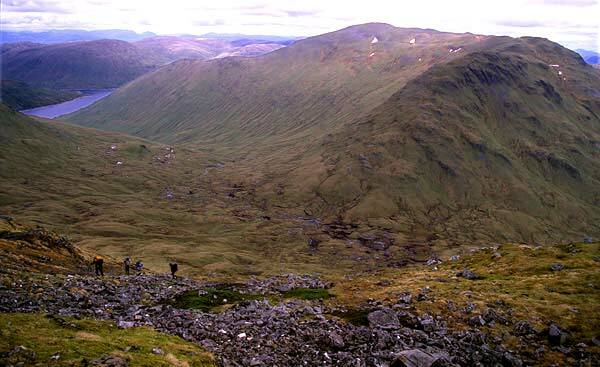 Beinn Heasgarnich is a large mountain with easy slopes and broad grassy ridges, it has scattered rocky outcrops which are easily avoided. The biggest problem with Beinn Heasgarnich are the boggy areas around it. 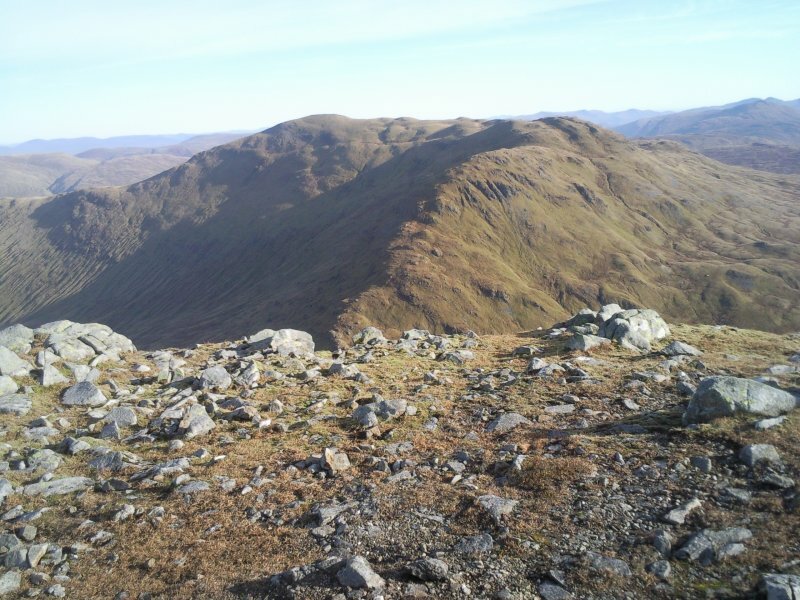 The normal ascent routes for Beinn Heasgarnich are from Creag Mhor via the SW ridge, from the road to Kenknock taking the shortest route round the N of Creag nam Bodach and along the Alt Tarsuinn to the summit, or from the road crossing of the Allt Badour to the S, bearing NW then N to the summit. Beinn Heasgarnich from Beinn a' Chuirn. Beinn Heasgarnich and Loch Lyon from near summit of Creag Mhor. 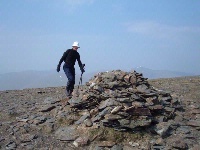 The summary information of one or more ascent routes that include Beinn Heasgarnich. 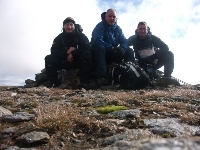 1 1635 m 20.27 km 7 hrs Beinn Heasgarnich and Creag Mhor [Glen Lochay] Easy walking on gentle slopes, but there is boggy ground to cross. Best when frozen or in dry weather. 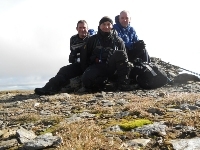 At the summit 22/4/11.Second of the day. 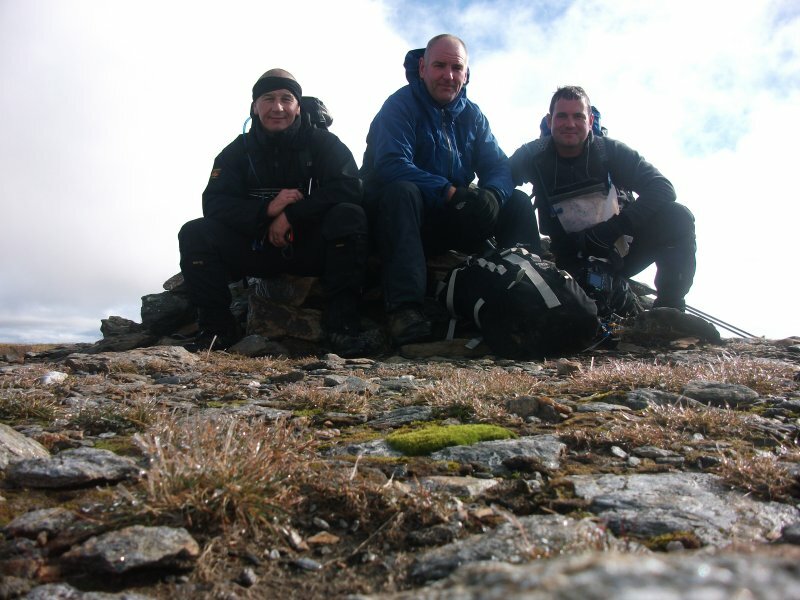 me with my good friends john donnelly & john frew on the summit of beinn heasgarnich on a crackin saturday afternoon. 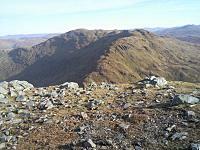 Post a few words about Beinn Heasgarnich or read what others have had to say. Descended from Creag Mhor NW to avoid steep crags on Creag Mhor to drop to Lochan ne Baintighearna.Bheinn Heasgarnich looks a long way up on a steep NW slope but it`s not as tough as it looks from here on an obvious path.The path leads to the South top then North to the summit cairn on a flat top.Descend Eastwards over very wet ground and on to a high hydro track.Large divots have been chopped out of the ground by a digger East of Sron nan Eun.My twisted knee was now very sore by this stage.Thank You! The hydro track leads to a large pipeline where you can easily descend to Kenknock Farm and back to the car park.These hills are not the most interesting but a great feeling of wildness is the reward.Especially at Forrest of Mamlorn.Never met any one over a 9 hour trip. Bikes ? What's that all about. I have ridden mountain bikes for years but I would never take a bike when walking. Sounds like a dive in the box to me! Nice dry day. Both hills were pretty easy as it was nice and dry. A wet day would have been a lot tougher. Stopped for 3/4 hour break at bottom of Sron Tairbh. 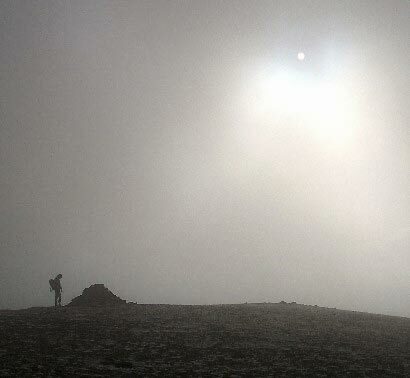 The bog trot back after Beinn Heasgarnich was a wee pain. Lots of photos taken. Spotted 2 deer. They must have fallen out with the herd! All in all a very good day but longer than planned. Do yourself a favor and use a bike on this route. Park at Kenknock and cycle to Badour (or Batavaime). Ascent of Creag Mhor via Sron nan Eun is quite a steep grassy flog. The descent (or ascent) directly from the summit of Heasgarnich to Badgour is straightforward, though will be boggy in wet conditions (minor crags 1 mile SE of summit @ 909m are easy to avoid). 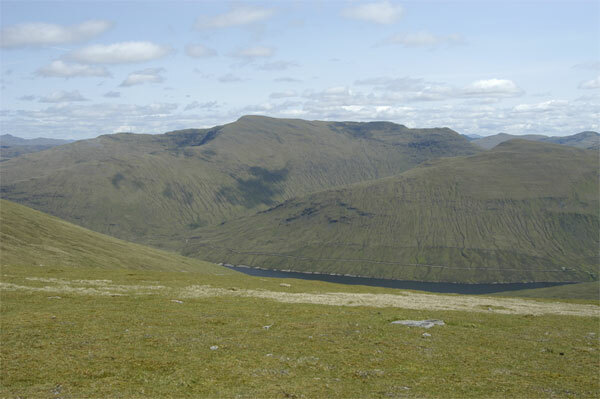 Climbed this hill using public transport from Bridge of Orchy train station. Cycled south to the railway viaduct and walked up Auch Gleann, cutting over to Loch Lyon, all on decent paths and tracks. Brilliant and unexpected (not on the map) land rover track skirts Loch Lyon providing easy access to the wild side of Heasgarnich, whose north ridge is a steep but straightforward climb (likely to be far tougher under snow). Recommended route of course if you are using public transport, or if you simply want to avoid all that nightmarish boggy ground on the hills eastern side!